Bathroom Remodeling - Time for a Change? Would ceramic tiles, a soaking or jetted tub, granite countertops, double sinks, or maybe even a sauna enhance your bathroom experience? 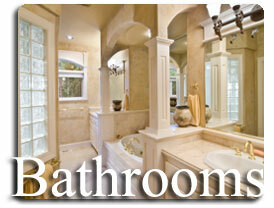 Refresh and relax with our professional bathroom remodeling services. Using the best quality materials and professional installers, we can offer excellent solutions for your bathroom remodeling needs.